Humour might be the best medicine but it also one of the primary tools of presenting a critique of society. Political cartooning does not only provide a commentary on recent events but also throws lights on the issues plaguing the society. But according to E.P Unny, the Chief Political Cartoonist, Indian Express Group, political cartooning is losing visibility in the public sphere and is on the verge of disappearance. By Tanvi Jadwani, Theja Ram and Vinayakk M.
“You do not have to carry free speech so far as to be stupid,” said N. Ram, former editor-in-chief of The Hindu group of publications, referring to how the Charlie Hebdo cartoon on the Prophet and the subsequent terror attacks could have been avoided with a little bit of editorial restraint. Chennai: R.K.Laxman was hailed as an unambigious genius, by various editors and cartoonists at the inauguration of a symposium on cartooning held at the Asian College of Journalism (ACJ) on Monday. The digital era has not affected the way a cartoon is drawn but it has changed the way people can access these works of editorial artists, according to senior cartoonists. “In the era of internet, though cartoon as an art form has not undergone any changes it has made accessibility easier,” said Surendra, editorial cartoonist of The Hindu. 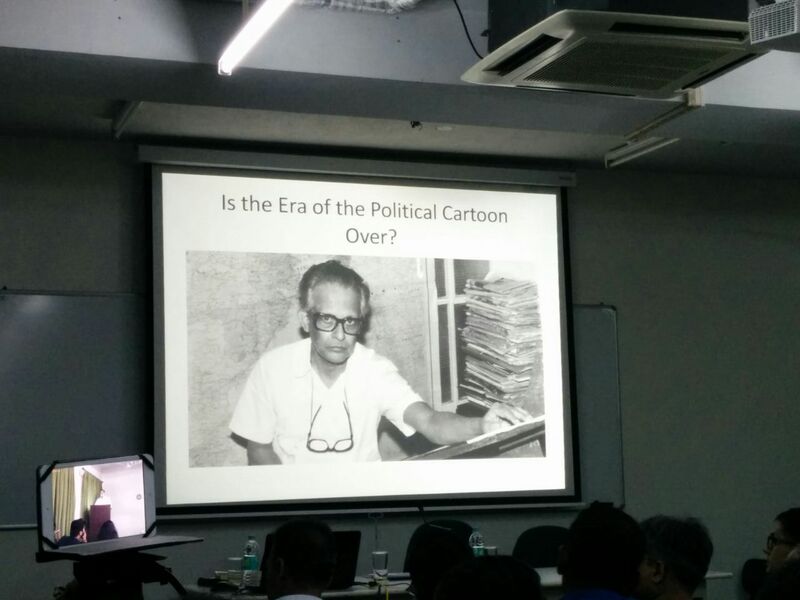 Speaking at a symposium held to commemorate R.K. Laxman and Rajinder Puri on April 6 in the Asian College of Journalism, Surendra insisted that the digital media with tools such as Photoshop and Illustrator had not changed the way he drew his cartoons. He still used his pencil and paint brushes, he added. Chennai, Oct 21: With a scarcity in the number of animal shelters in city, the arrival of monsoon with heavy rainfall has created a lot of problem for its fauna. 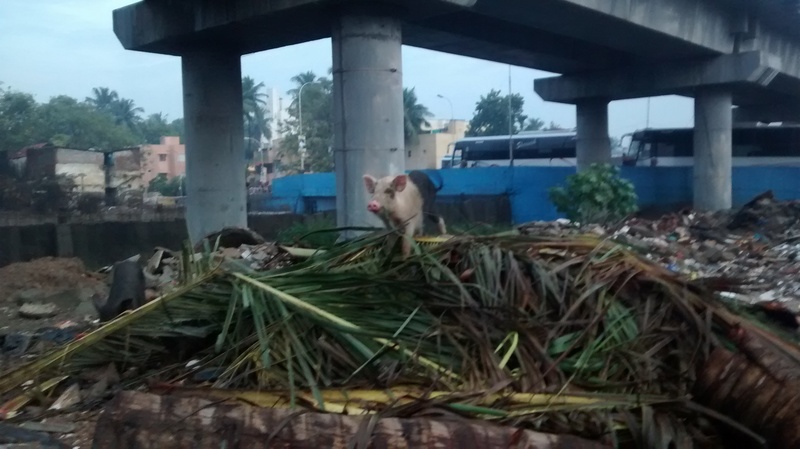 Flooded roads, open manholes and uprooted trees have all contributed to the inconvenience of the street animals in Chennai. Mostly all the animal rescue services in the city depend on a phone call from the citizens to the NGOs. There is no specialized rescue team that works to help animals reach a safe haven during such crisis. The animals which go unreported or the smaller animals which go unseen get no specialized attention from any of animal welfare organizations in the city. “There are not enough animal shelters in the city. The NGOs are always busy with some or the other rescue. Even when they manage to send volunteers, they do not know what to do”, she added. S. Vinod Kumar, Assistant Secretary of the Animal Welfare Board of India, said that they haven’t received any calls in the past three days complaining that the heavy rainfall is affecting animal welfare in the city. “It is not physically possible for a team to be present in various parts of the city to take care of every animal that has fallen, it never happens” he added. The Blue Cross of India, which started with an attempt to save dogs drowning in a flooded street receives about 50-60 calls every day, says Satya Rama, an Honorary Secretary of Blue Cross. “Every day is a crisis day for us”, he says, “with only three ambulance and so many rescue calls, we already have a handful”, he adds. “Animals get stuck in deep muddy dicthes or under fallen trees. Rainy season is the time when people should open their gates for the welfare of the animals”, advises Anuradha Chawla who lives with eleven dogs that she has rescued. Posted in Ecology, Environment, Monsoon, Uncategorized, Variety and tagged Animal shelter, Animal Welfare Chennai, animals, Chennai Animals, North-East Monsoon on October 30, 2014 by tanvijadwani. Chennai, October 25: To some paper is a medium to write, doodle and scribble. For some paper is disposable. But for the rest it is art. 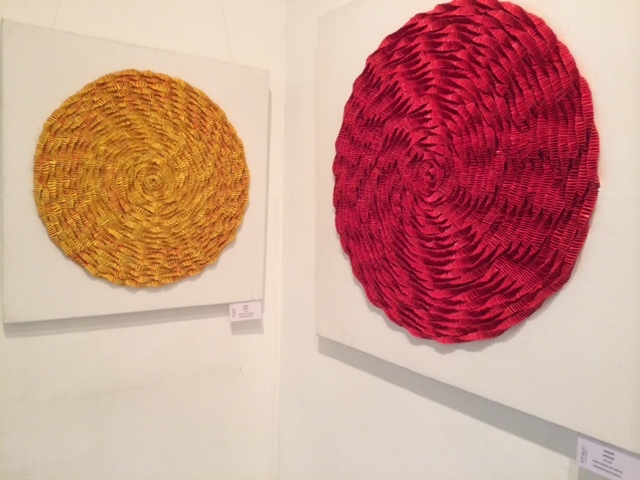 ‘The Passion of Paper’ arts exhibited at the Apparao gallery, was an amalgamation of styles with paper as a common denominator. The paintings were diverse in terms of concept and techniques used and brings together 13 contemporary artists from across the country. 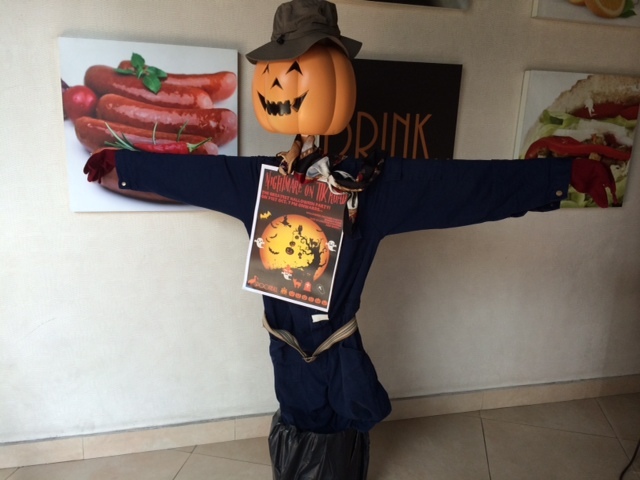 Chennai, Oct 29: A jack-o-lantern donning an olive-green packer hat and a dark-blue cloak standing on a black bean bag with its arms stretched out welcomes customers in Spoonbill Resto Cafe in Mylapore. It is the time of the year when scaring and being scared are pretty run-of-the-mill. It is Halloween.